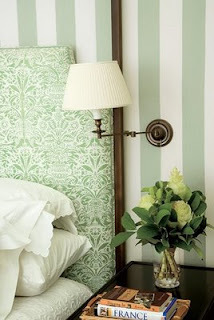 A Charmed Wife: I heart...Palm Beach Style! Palm Beach is known for its distinctive style- both in decorating and in fashion- and I happen to be a fan. It seems to me that true Palm Beach style is the love child of casual and comfortable beachiness and gilded ornate opulence, with a dose of hallucinatory Technicolor thrown in. While I have been known to sport a Lilly Pulitzer print or two in my day (but never more than one at a time), I tend to prefer Palm Beach in its subtler incarnations- the beauty that results from taking the natural beauty of coral, palms, seashells and sand and elevating them as objets (that's French for objects), of using heavenly silks in simple beachy stripes, or of framing a rustic print of sea creatures in a gorgeous gold frame. I love this nautilus shell on a mohogany stand ($100). It goes to show that sometimes things from nature are more elegant than anything we humans could come up with. 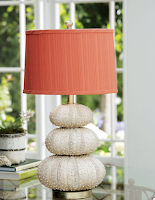 This sea urchin lamp from Horchow is on sale for $172, with free shipping when you use the code "lovehc". I love the coral-colored shade on this sucker. 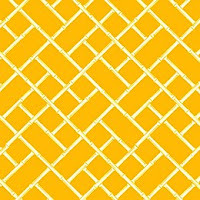 These colorful graphic wallpapers would be great in a bathroom. The yellow bamboo pattern is from Woodson and Rummerfield's for $88/ roll. 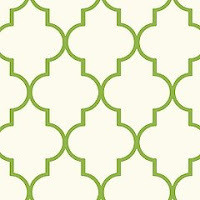 The green lattice is from Ballard Designs new line of wallpapers for $119/double roll. 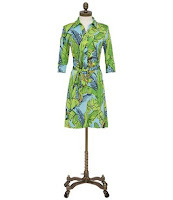 It wouldn't be a Palm Beach posting without a little Lilly thrown in- this is the dress I am lusting after in the new Spring collection. It's $278- but I'm hoping that the poor economy combined with the power of prayer will get this puppy on sale in time for Easter.